This week, they start weekly couple’s therapy with a new therapist. Tyler and Catelynn ask that their session remain private. No cameras are allowed to film. This to me shows there is more trouble in paradise than they would like the world to know. Over the years, they both have been very open about their life and all of their problems. Catelynn hopes the new therapist will help her feel more secure. Newsflash… Catelynn, no one is going to be able to help you do that. There are some dependency issues that need to be addressed and rectified in order for her to begin a healthier, happier life. After therapy, they both meet with Tyler’s mom for dinner. She asks them about therapy and the separation. She tries to give some sage advice. Basically, she tries to soften the blow of her son requesting this separation. Who do they think they are fooling? We know that is not anything Catelynn is happy to do since she depends so much on Tyler. Tyler and Catelynn discuss the separation and how it will affect their daughter, Nova. They agree that they can each take weekly turns their daughter. Finally… the moment we have all been waiting for… Catelynn gets real about her true feelings. After weeks of trying to convince her family and the viewers that she was okay with this separation, she reveals her true feelings to Tyler. She is worried that this may be a slippery slope that lasts longer than 30 days and that it may happen more than once. She clearly doesn’t understand why they need to separate. Tyler does not want to hear it. It is evident that he looking forward to this separation a lot more than Catelynn. I truly can’t blame him. He had to be the rock for almost everyone in his life financially and emotionally. Catelynn questions his plan for her to move into the new house after the separation. This is a valid concern given the situation, but he assures her that he only intends for them to be apart temporarily. It’s Cheyenne Floyd’s birthday and she rents a house to host friends and family to celebrate. She tells her friends that her feelings for Cory Wharton have grown. I doubt her feelings have actually grown since breaking up with her ex. It’s been clear all season that they were always there. It was so obvious! Her ex-boyfriend broke up with Cheyenne because he knew he could not compete with Cory. Of course, Cory is in attendance at the party because he gets the invite to EVERYTHING. Her friends, who are just as delusional as she is, ask what she will do if other guys try and flirt with her when they all go out to the club later that night. Umm… seeing as though you are single and NOT in a relationship with Cory, why is this a question? Could it be because, in her mind, Cory has always been her man???? On the way her club, Cory calls Cheyenne and says her ex is here (not Zach). She claims Cory was mad and seemed angry after seeing her ex. He even repeatedly commented on how perfect his beard was. She talks it over with her family and friends the next morning and they seem excited that he may have been jealous. In their minds, his reaction shows that he has deeper feelings for her beyond co-parenting. I think it’s simply because the attention wasn’t completely on Cory for once. Cory and his friends come back to the house to continue the celebration. Cheyenne confronts him about how he reacted at the club. Cory finally reveals what the viewers have known since the beginning. He doesn’t think they should cross a line beyond friendship. I don’t care how much Cory flirts, he has no desire to be in a relationship. Cheyenne seems a little delated, but I guess we will have to wait until next week to learn more. Amber Portwood talks with one of the producers about being bipolar and how it affects her relationship with Andrew Glennon. She feels like he is very supportive, but it’s hard for him to understand what she is going through. Apparently, he does more than stare awkwardly and hold the baby. She shows us a charcuterie board he made and cute sign in hopes of cheering her up. Amber knows that he does little things like this to try and be supportive, but worries that when she is unaffected, that he feels like he hasn’t done enough. 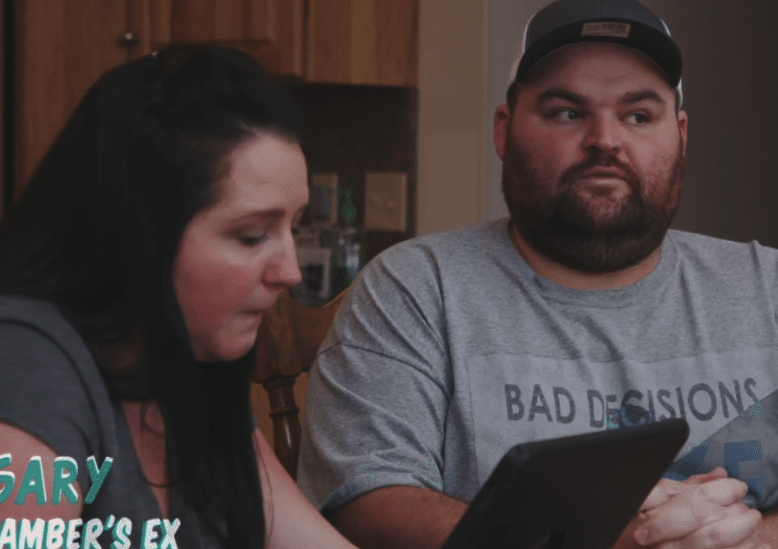 Andrew calls his sister to get some advice and just to vent about the situation with Amber’s medical condition. Andrew suggests that she goes to a support group for women with post-partum. Then, she totally snaps at him. He tries to help, but Amber does not want to hear it. I would feel bad for him, but if he saw her behavior with her ex, Matt on Marriage Boot Camp (which he did as a crew member on that show!) and still decided to pursue her, then he knew what he signed up for with that relationship. Good luck Andrew, you are going to need it! The private investigator found who he believes is Gary Shirley’s father. He has made arrangements and they plant to take a DNA test. Gary is excited but he doesn’t want to get his hopes up. He has already been down this road with another man and hopes this isn’t a repeat of that. Gary gets his lab tests back and he is scared to open the results. He lets his wife, Kristina Shirley do the honors. The test reveals that after searching, he has finally found his biological father. Gary and Kristina meet with his dad, Mike to share the good news. I’m so glad Gary finally has closure and knows who his father is despite his mom not being more help with the search. Mike actually seems like a nice guy. I wonder why his mom wasn’t more helpful. The family is finally settled into their new house. The only issue now is that Maci Bookout’s daughter, Jade has problems sleeping. Her husband, Taylor McKinney takes their daughter to the doctor and they find her tonsils need to be removed. Taylor and Maci worry about the surgery due to Jade’s age and the use of anesthesia. Bentley had his tonsils removed as well, but he was six when it was done. At dinner, Maci informs Jade that she will be going to see the doctor. Jade innocently questions why. Maci tells her she is going to get some grape juice, go to sleep, and then wake up with a Popsicle. I know it’s difficult to explain a surgery to a three-year-old, but I felt bad for this cutie pie. Jade makes it out of surgery and you can tell she isn’t feeling well, but she takesit like a champ. Poor thing. Bristol Palin’s ex-husband, Dakota Meyer is out of town visiting his family with the girls. She decides to use this moment to text him about getting on the same page and having better communication. Apparently, Bristol has issues with Dakota and feels that their co-parenting relationship could be better. She thinks they both shouldn’t be bashing each other since it affects the kids. In the past, she accused him of holding family photos hostage and a back and forth ensued on social media after she posted about it on her Instagram stories. Bristol fumes that Dakota hasn’t responded to her text message. In a phone call, he asks her to text or call when she isn’t on camera trying to start drama. She claims she likes communicating when it’s on camera because provides a “level of accountability”. Wow… who thinks like that? She clearly hasn’t watched herself on camera because she doesn’t seem to take any accountability for the downfall of her relationships. Dakota, on the other hand, feels like he has no expectations for her at this point. She is just petty and likes to start drama. After what I have seen this season, I am inclined to agree with Dakota. In front of the cameras, Bristol says that they shouldn’t bash each other because they need to do what is best for the kids. Yet, in every single scene, she is bashing Levi Johnston and Dakota and creating the narrative that they are terrible to her and we are seeing just the opposite. To sum it up, her scenes are talking about how much she hates these guys. In contrast, their scenes are doing activities with the kids. Who really is bashing who??? TELL US –DO YOU THINK THAT CATELYNN WILL BE MOVING INTO THE NEW HOUSE WITH TYLER AFTER 30 DAYS? WHOSE SIDE ARE YOU ON- BRISTOL’S OR DAKOTA’S?